I finally got around to playing through the Goblin start zone and whilst there were some amazing moments, I found myself wondering exactly which game I was playing. Kezan itself reminded me too much of Grand Theft Auto, as I beat people up for protection money, robbed a bank (albeit for my own gold) and ran people over, although the latter might have more to do with my truly appalling driving than design intent. Then of course there was Chip Endale, my slimy ex-boyfriend. I have to say I wasn’t impressed. My Goblin just wouldn’t have ever dated that particular loser and nor would she have ripped his heart out. Now sure, I can imagine my Warlock doing that and then feeding said organ to her felpuppy before licking his blood from her fingers but my little resto shaman… it’s just not in her character. I realise that the whole scenario fits in with the Grand Theft Auto/Sopranos attitude and atmosphere that the Goblins have but it was a rather uncomfortable quest for me and I normally take wholesale slaughter, murder and torture quest lines in my stride. Whilst I didn’t particularly like the quest chains, I did love the slummy, dirty and downright nasty look of the zone. From the paint flaking off the nodding flamingos in the yard to the pineapple wallpaper, the level of detail is amazing. Even though it’s basically Paradise in meltdown, I kept finding things to stare at. It look me a good five minutes to complete the quest to burn down my headquarters, just because I was fascinated by the furniture. Whilst I found going from level 1 to 12 in the Goblin zones novel, I wasn’t left with a great desire to do it again. 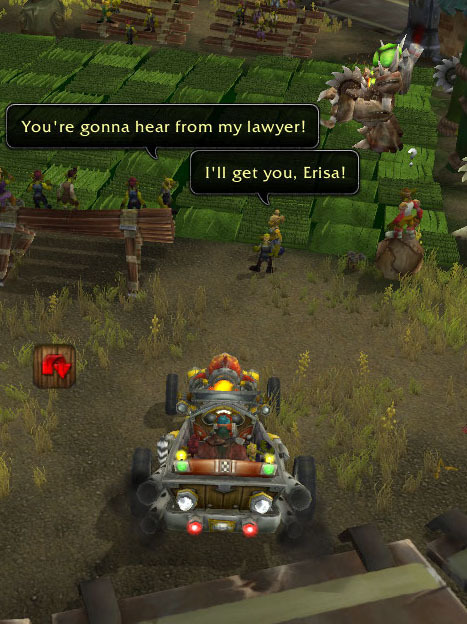 Racing around Kezan in a car with it’s radio blaring was fun for a while. As was exploring the dingy streets, simply because it’s pretty far removed from anything else in-game but by level six or so I found myself longing for the haunting paleness of Tirisfal or the red rocks of Durotar. 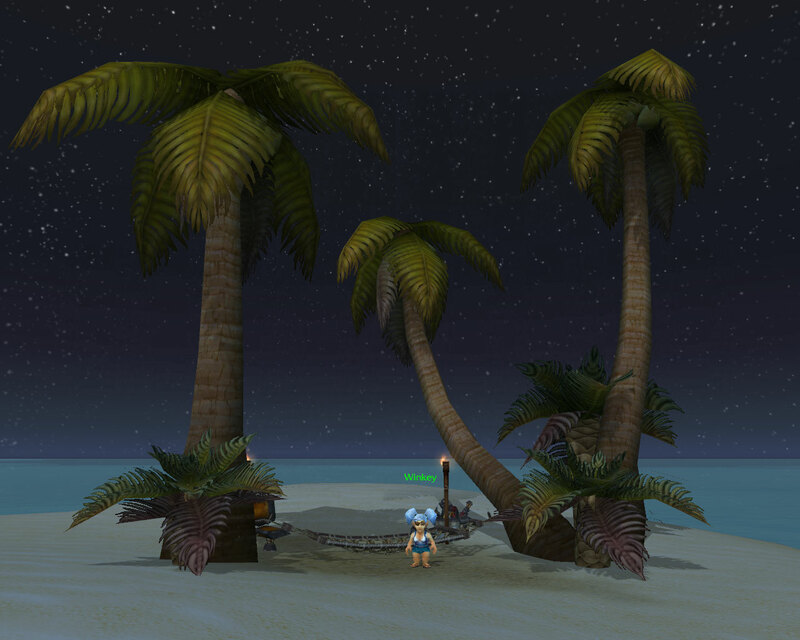 The Lost Isles too was a visual treat but the quests for the most part left me cold. Along with the heart ripping out episode, I really didn’t like Thrall of all people telling me to kill a bunch of terrified sailors huddling in their lifeboats or already drowning out at sea. I rather expected better of him, but it seems being captured by a bunch of level sevens put him in a rather bad mood. The luring of baby naga with an inflatable sea horse also seemed to demonstrate questionable taste. 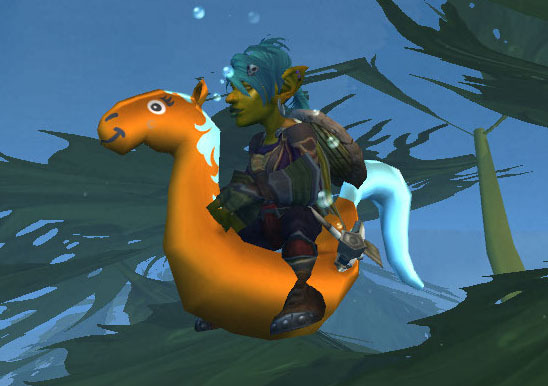 Although I’d love one of these as a mount, would be far better than the sea turtle or that sea horse you get from questing in Vashj’ir. 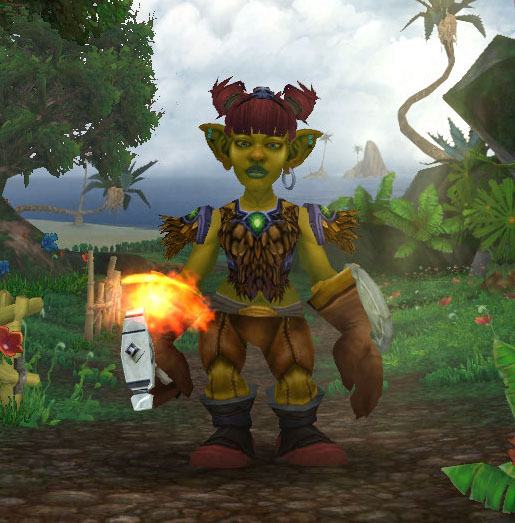 The options for customising your Goblin on the other hand are fantastic. Mine is modelled slightly on Abby from NCIS, with a skull headband and plenty of attitude. In a sense I feel disappointed with myself. I normally love questing yet I’ve been lukewarm about virtually all the Cataclysm zones so far. The storylines are a strange mix of being too personal and yet manage to be impersonal at the same time. It feels as if rather than creating your own reality within the game, you’re just being carried along through other people’s imaginations. Now sure, in most games there is nothing wrong with that but in Warcraft it feels uncomfortable. Whilst I’m not particularly into RP, I’ve always imagined semi back stories for my characters and having partners and crimes of passion foisted on them is unpleasant and I believe unnecessary. Yes, obviously the zones and the creatures that inhabit them have always been someone else’s creations but this expansion has taken it to extremes. I still have Vashj’ir, all the revamped Kalimdor quests and the Worgen start zones to finish, so hopefully they will fix some of my cynicism and general hatefilledness towards Cataclysm questing. 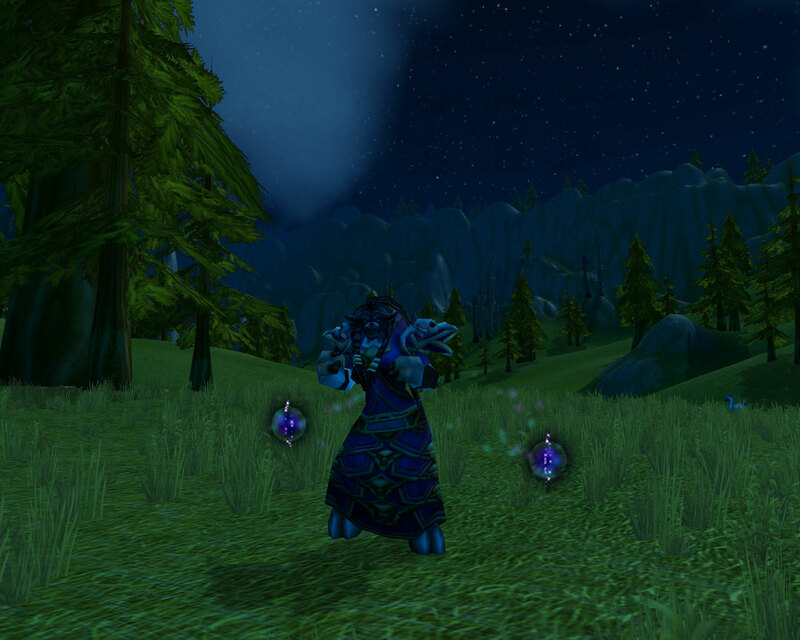 Otherwise it’s going to be a slow and painful route to 85 for my baby Shaman. I haven’t really had time to write about my journey to 85. The last ten days has been a hectic swirl of quest, quest, quest, dungeon, dungeon, raid, raid, raid. However, we’re now at 8 out 12 bosses killed and things are starting to calm down a bit. First of all, I play on a PvP server (EU Auchindoun) and we (the Horde) are heavily outnumbered. World PvP otherwise known as ganking can usually be found all over the place so I wasn’t particularly looking forward to the questing part of our levelling plan. We ran guild Blackrock Caverns until 82 but that still brought us out into Deepholm surrounded by Alliance. However much to my amazement, we weren’t attacked at all all the way to 85. We killed mobs side by side with plenty of Alliance groups but no one threw as much as a white hit our way. As for the questing, I have one issue with it. Why oh why is it so linear. Arrive somewhere, pick one or two quests which usually involve pickups and then be unable to move forward with the storyline until you’ve completed those one or two objectives. I much preferred the old model of arriving into a hub and being able to collect 10 or so quests. 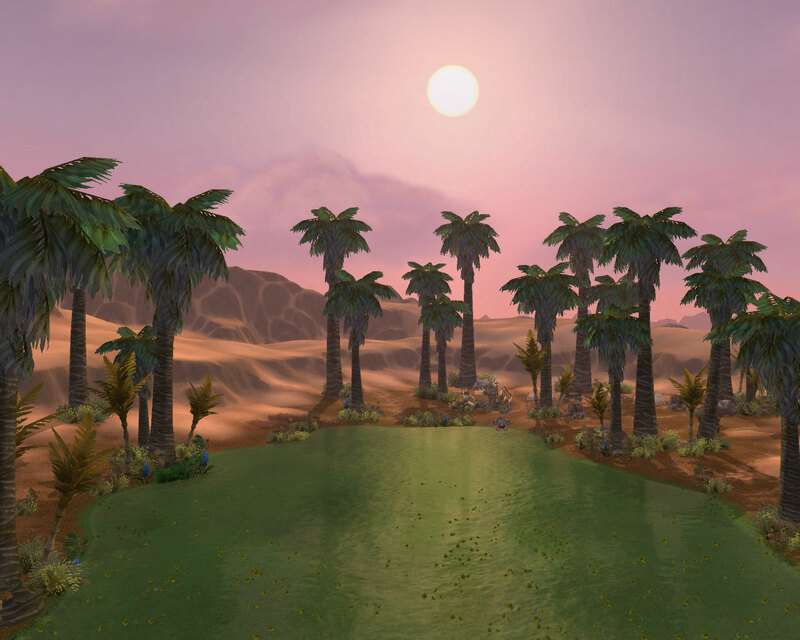 Wandering around doing multiple things always feels far more “real” than one guy sending you off to pick up crocolisk eyes and coming back to find the person standing next to him has just decided he wants a herb from the very same swamp said crocolisks were swimming in. I ended up feeling slightly foolish as I ran backwards and forwards running several errands which I felt I should have been able to complete at the same time. The funnelled feeling also makes spawn camping a nightmare as fifty people are all trying to kill the same ten mobs to progress. Yet instead of being able to go off and do the quests in a different order, we had to stand there, in my case spamming holy nova ready to tag the next one. Visually, I’ve been blown away. From Hyjal through Deepholm to Twilight Highlands there is so much stunning scenery. My new favourite NPC has to be Therazane, with her passing resemblance to the Venus of Willendorf. My least favourite is quite possibly Harrison Jones. By the time I finished Uldum it felt as we were replaying Lego Indiana Jones rather than World of Warcraft. There is such a thing as too many cutscenes, especially when they are prone to bugging out when done in a party. Watching your character run over sand dunes for a good three minutes is not fun. Neither is skipping them and missing out on part of the story. Where is the sense of feeling that you are at least in semi control of your destiny, rather than falling into one scripted disaster after another. I’m a hero with two dead Old Gods on my CV yet a bunch of pygmies with hyenas and pointy sticks was enough to bring me to my knees. Rather than lining up his resurrected children (who have already been found wanting), Deathwing should be hiring pygmies to defend his sanctum. The camels and the view made it all worthwhile though. 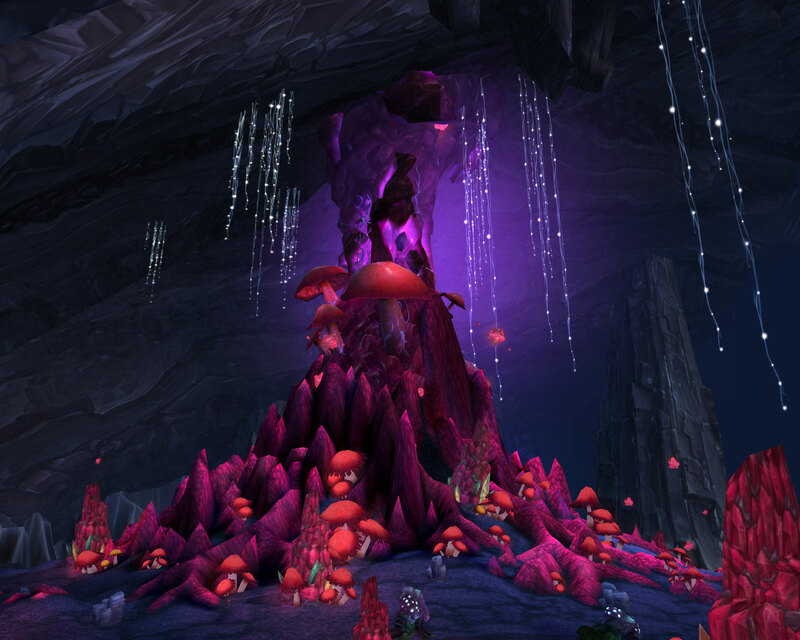 As for the dungeon and raid content, I’m fairly impressed. I wouldn’t say any of the raid fights on normal have been hugely hard but I’ve definitely enjoyed several of the encounters a lot more than I did most fights in Wrath. Magmaw, Atramedes and the Twilight Council spring to mind as my favourites so far. So Cataclysm has been with us for almost a week now and I’ve been 85 for most it. I’ve completed all the five mans on normal, some on heroic and have also found the time for a spot of raiding. Healing has most definitely changed, the spamfest of Wrath is certainly impossible to recreate with the gear currently available to us. 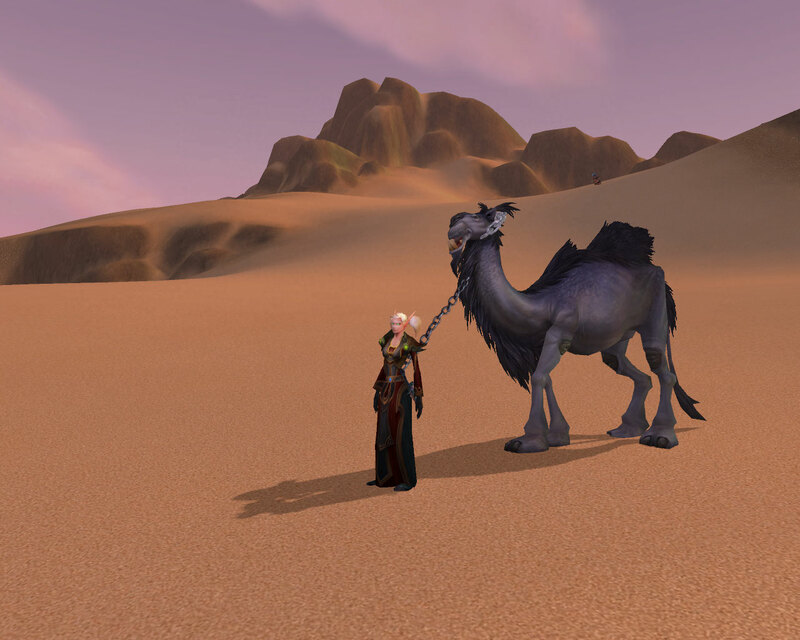 However I don’t think the PvE scene is as depressing as the WoW forums are making out. Each piece of gear we get really helps. Going from an average item level of 329 to 339 made a massive difference to me. I noticed as well that doing Heroics with Blessing of Might/Replenishment made things considerably easier than doing them without. In terms of gear, you want spirit on every item. In fact you want as much spirit as possible. Reforge to it if you can’t find spirit items for a particular slot. I’d recommend consumables for heroics too, stacks of mana pots if nothing else but ideally flasks whilst your spirit is low. Buy the best water available and buy lots of it. I currently try and carry 80 at all times. CC in Heroics makes an amazing amount of difference. Nasty trash packs with just one or two mobs sheeped, sapped or banished becomes so much easier and less of a drain on your mana. Also don’t heal through stupid, lifegrip them out or let them die. Lightwell is amazing (which I have to admit, is one sentence I never ever thought I’d be typing), put it down on tough trash and bosses. If people don’t use it, nag them until they do. Our tanks for example range in health from about 140k to 160k, 30 percent of that is 42 – 48k so on quite a lot of content, they can use it too. 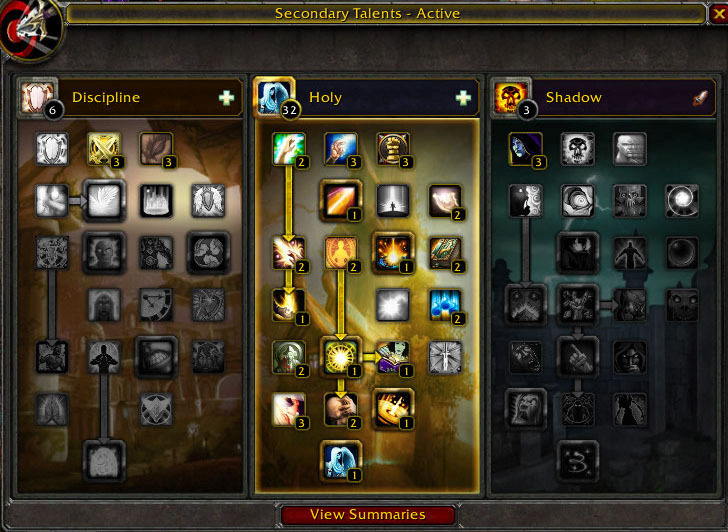 As for talent choices, this is what I went for. Notice no Archangel/Evangelism and to be honest, I’m really not sure where I’d be casting smite to benefit from it if I had it. Nor do I have Surge of Light, primarily because I prefer Greater Heal in almost every scenario except entering Chakra: Serenity. Even on fights where I do cast a fair number of Heals, I’m not convinced that 6 percent is a high enough number to make it worth two talent points. I also don’t have a minute off my shadowfiend cooldown. I’ve been backwards and forwards several times over this and am still considering ditching 2 points in the haste to improve Basil the annoying shadowfiend. However at the moment, I’d definitely say that my mana is getting more and more manageable with every item I upgrade. I’m thinking about dropping one or both points in State of Mind because I’ve macro’d Chakra into both my Heal and Prayer of Healing spells. Thus if it’s off cooldown, it automatically recasts itself when I cast them. I avoided putting it on Prayer of Mending because quite often, especially in Heroics, I go Prayer of Mending then Heal to get Chakra Serenity up. I think two points are definitely overkill and might reduce it to 1 and put the spare into reducing my shadowfiend. Lightwell is amazing, I just can’t say this enough. Now that we’ve got into raids/heroics, people are actually asking for it to put down and making the effort to use it. Prayer of Healing is possibly too good too. Especially since lots of fights seem to involve everyone taking plenty of damage all at the same time. Now that I’ve done some raiding, I’m starting to like Inner Will a lot more too. Fights still involve lots of running away from things, whether they are evil face munching parasites or just the average blob of fire on the floor. Negotiating your way through the bad stuff at speed is awesome. Given that both Inner Fire and Inner Will are free, I’m definitely going to have to get used to swapping them backwards and forwards a lot more. All things considered, I feel fairly positive about being a Holy Priest in Cataclysm. Sure there are some buffs I’d like to see but I think our toolbox is pretty good as it stands right now. Along the road to 85, we picked up three new spells. At lv 81, we got Mind Spike. I hate to admit it, but at first I thought it was a lacklustre spell. What did I, a Holy Priest want with yet another dps spell. However when out questing, I started to experiment with it and in a complete about face, it’s become my favourite spell of the whole expansion. Relatively, it’s cheap, fast to cast and if interrupted/kicked in pvp, your healing school is fine. I did a quick test on the target dummies, smite plus both dots being refreshed when they ran out versus mindspike over 45 seconds. 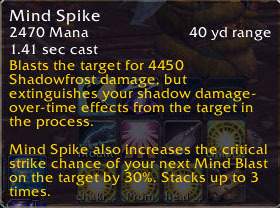 Not only did the mindspike spam do more damage, it was also cheaper to sustain. Then of course, with my haste there is the 1.88 second smite cast versus the 1.41 cast time of Mind Spike. I wasn’t weaving in Mind Blasts, simply because as Holy, my Mind Spike hits harder than my Mind Blast crits for. Next up was Inner Will, a new type of armour. The movement speed is nice and of course so is the mana reduction of our instants but when I put it into practise in dungeons, I was a bit underwhelmed. As Holy if I need to get somewhere fast, I use body and soul. I also found that most of my healing in the dungeons I’ve run so far (no heroics yet, still gearing up), has been cast time stuff so no benefit to be gained there either. My top spell over a bunch of five or six dungeons was Heal, followed by Renew, then Greater Heal, with Prayer of Mending coming fourth. Ghostcrawler would be proud of me. Yes, I’ve been using renews but I’ve been trying to keep them rolling using Chakra: Serenity rather than recasting them repeatedly. If we compared it to good old Inner Fire, which now provides 531 spell power and 60 percent more armour, it’s really going to depend on the fight. To put that into context, without Inner Fire, I have 5188 spellpower and 7143 armour so using it is a fairly decent spell power gain. With Inner Fire, my armour jumps up to 11429 which makes it my default armour of choice in PvP. Luckily neither of the armours cost mana now, so switching on the fly is going to have to become normal behaviour both in PvP and PvE. Finally we got Leap of Faith. If you struggled to know when to use Divine Hymn, Guardian Spirit or any of our other highly situational cooldown spells, well Leap of Faith is similar. With hindsight, I realised there were lots of places using it would have made my life easier in the dungeons, but so far I’ve used it mainly for “playing” with guildmates. Definitely going to need lots of practise here. The graphics are amazing though. Whilst I haven’t got as far as a Heroic yet, I really don’t think that Archangel/Evangelism will be required as Holy. It definitely isn’t for the higher level normals. Dps stood there at half health whilst I drink should be thrown in the Murloc Parliament’s Bee Pit. Most people only click on the Lightwell out of combat. Which is a real shame because with our vastly inflated health pools, you hardly ever see it break on damage, even on the tank. The brief amount of PvP I’ve taken part in so far, (Tol Barad) seemed ok. People weren’t dying too fast and my own survivability wasn’t an issue unless three or four people were all focusing me. Luckily there are lots of pillars/bits of buildings for ducking behind and drinking though. Carry lots and lots of water, you’re going to need it. Healing does feel different that’s for sure. However once you get used to the damage levels and wait a suitable amount of time before healing, I didn’t find it too bad. Plus my overheal has decreased considerably as I’ve been playing a lot more attention to what I’m doing. Across those five or six runs, my over heal worked out at about 6 percent. I don’t remember it being that low since Classic WoW. Instead of casting renew when people are at full health for example (bad habit I know), now I’m waiting until they are down roughly 20k so I know none of it will be wasted. I quite like our mastery too, especially for 5 mans. Not sure how it will play out in raid environment but it was accounting for an average of 12 percent of my effective healing today. With a bit of practise, that could probably be a bit higher and my overheal slightly lower. All in all, the sky isn’t falling, it’s just going to take a bit of getting used to. Plus I definitely need to lose some of the bad habits I’d picked up, like not caring too much about overheal and attempting to over-compensate for my group when they were doing stupid things. Well I’ve got my 25 quests ready to be handed in, enough flasks for 40 hours of gameplay (I may have gone a bit overboard there) and loads of fresh fruit and other such healthy foods to snack on. With less than 3 hours to go, I’m getting a little nervous. I have my eye on various bits of loot I would like as I progress, I know which reputations I want and the order I intend farming them. Yet at the back of my mind there is this nagging doubt, the best laid plans and all that. 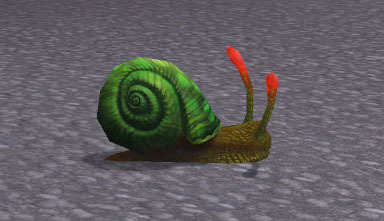 I shall leave you with a picture of a snail, because I can’t help thinking, this is the creature the log-in servers will most resemble come midnight. That said, it is a pretty amazing looking snail. 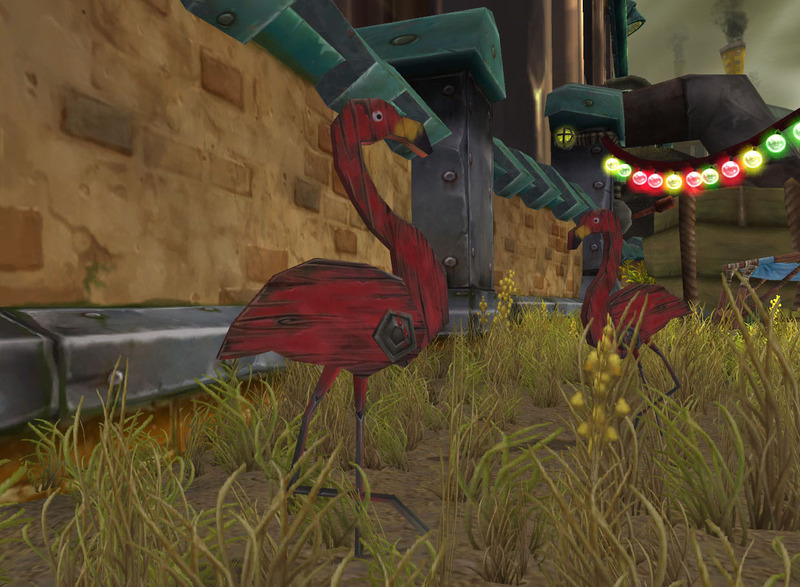 I hope at some point, they become either tameable by hunters or vanity pets. Edit: and it seems as if I was correct, it’s now 12.30 and most of my guild, myself included are still staring at the log in screen. I have a couple of favourite NPCs and picking a clear winner proved to be a touch too hard, so you’re getting my top four. First up, Sergra Darkthorn, Defender of Crossroads, Feminist, Quest Giver and all round awesome Orc. Really she should have been Warchief instead of Garrosh, failing that, they could really do with promoting her. Surely her talents deserve better recognition than standing on that same bit of carpet in a backwater like Crossroads for another five years. Next, High Commander Halford Wyrmbane <7th Legion>. Dividing his time between the Isle of Conquest and Wintergarde Keep, he is well known for his motivational speeches. “Through the valleys and peaks of Mount Hyjal, across the shifting sands of Silithus, against the Legion’s dread armies – we have fought. We are the nameless, faceless, sons and daughters of the Alliance. By the Light and by the might of the Alliance, the first strike belongs to us and the last strike is all that our enemies see. I have to admit, now that I’m Horde I feel a twinge of guilt every time we win IoC which given the pink boxes is 99 percent of the time these days. Number 3 is a certain Gnome and her evil twin. Finally we come to yet another Gnome, this time one lazying away the days on a tropical island. She seems to serve no real purpose, just hangs out in the sunshine, relaxing. (Yes, I’m slightly behind in the 20 days of Warcraft challenge, been a bit too preoccupied by Cataclysm preparations). All because the Lady loves …. All because the Lady loves Priests. This is Milkflay, my guilty secret. The name sneaked into my head one night whilst I was half asleep and got stuck. I knew I had to make her even if she never got higher than lv 1. My entire server seem to be rolling alts right now. You can’t move without falling over a plethora of Troll Druids or a legion of Tauren Paladins. Everywhere I turn there are Gnome Priests lurking and I’ve spent quite a few happy hours killing Dwarf Shamans and Mages. Yet Tauren Priests seem completely unrepresented, so I rolled one. She’s going to be shadow with possibly a Disc Smitelol offspec. Whether she makes 85 is in the lap of the Gods but in the meantime she’s great fun. I’d be amazed if she ever replaced Erinys as my main but hopefully levelling her as shadow will improve my overall understanding and comfort level with the spec. Up to this point, apart from levelling Erinys to 60 in Vanilla and a brief spell of honor farming also at 60 on my other Priest, I’ve hardly spent any time as Shadow at all. She’s also my first proper Tauren and this is the first time I’ve ever quested in Mulgore so it’s been a bunch of new experiences already. 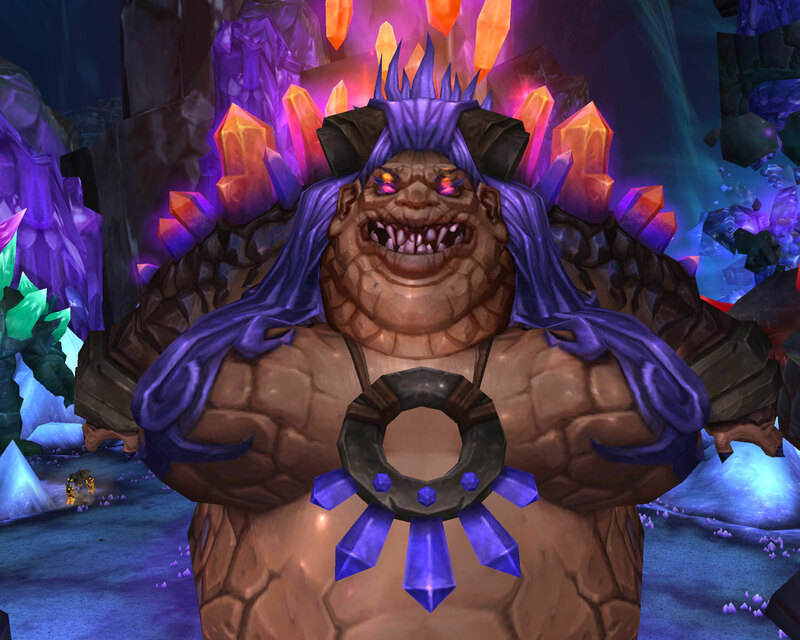 So far I’m loving the new shadow orbs, the way they rise of the ground when they spawn is rather sinister and I can’t wait for Shadowform.